Over this half term we will be looking at different modes of transport and the History behind this. In Science we will be focusing on materials, where we will discuss which material would be the best to make our toy cars. This topic also has huge links to History where we will be looking at The Wright Brothers and Amelia Earhart. 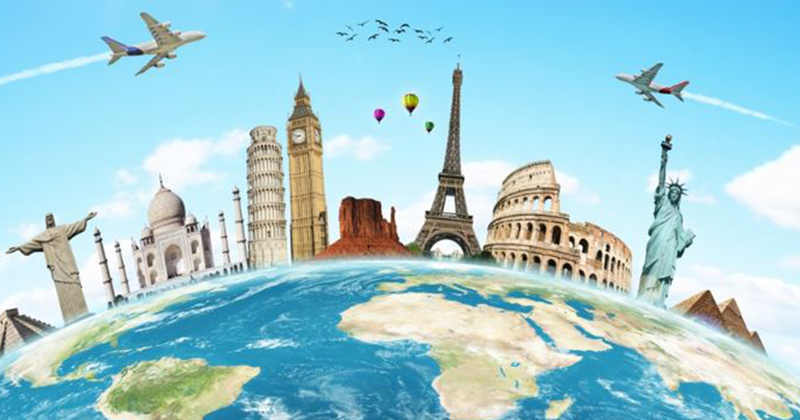 In Geography we will focus on comparing countries in Europe to those in other continents. In Literacy we will look at books linked to our topic. To start the topic we will be looking at the adventures of Flat Stanley. A boy who was flattened by a bulletin board. We will write our own adventure stories too. We will draw links with our history work and create a fact file based on flight. 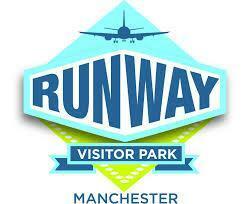 We are also planning to use our trip to Runway Visitors Park to spark lots of writing opportunities. In Maths we will continue to look at number an place value using a variety of practical methods. Year 1 will also cover Geometry and Position whilst Year 2 will concentrate on preparing for their upcoming SATs looking at a mixture of multiplication, division, addition, subtraction and place value. 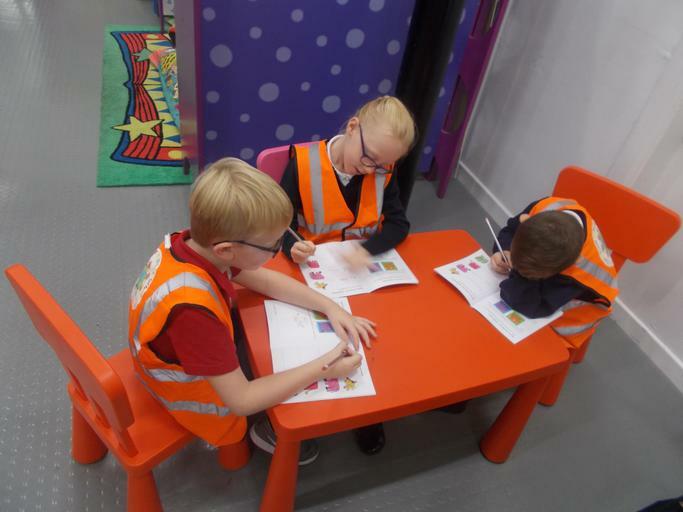 As well as all of the learning related to our topic, we are very excited to be visiting Runway Visitors Centre next to Manchester Airport. 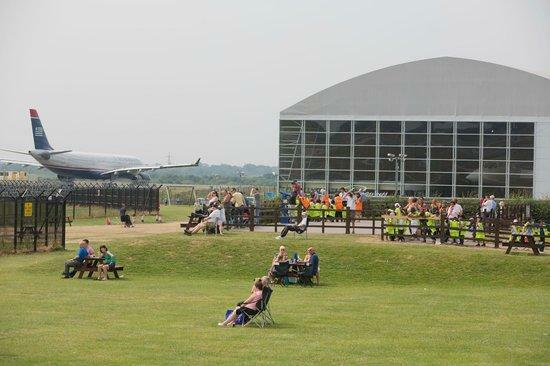 On the trip we will be learning about aircrafts, the jobs that people do at the airport as well as looking at the different types of planes on the park. If you have any further questions, please do not hesitate to contact the school or your child’s class teacher. How Do I Keep Myself Healthy? 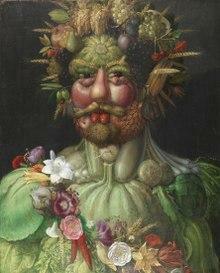 In topic sessions we will be learning about the artist Giuseppe Arcimboldo. We will be looking at how he uses fruit within his art and even create some of our own! 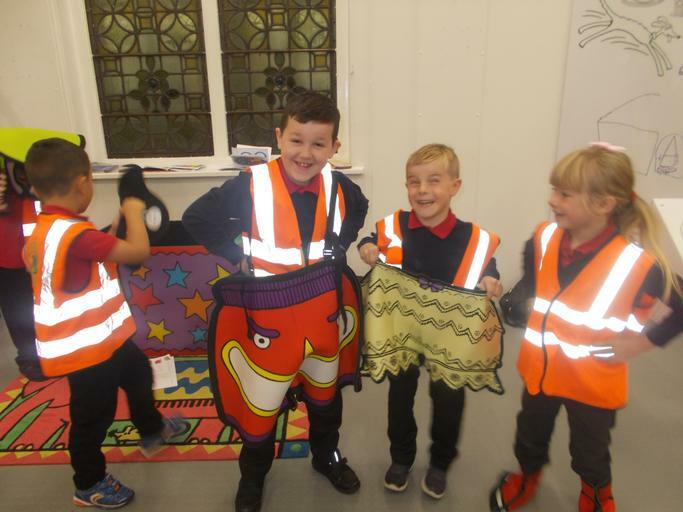 We will also be enjoying our science fortnight this half term, and will conduct lots of experiments to find out the affects of good hygiene, exercise and a healthy lifestyle. We will be having some special visitors in for this which we are very excited about! As well as this, we will be finding out about Joe Wicks, who is a fitness coach based in England. We will learn all about how he became so popular and undertake some of his online fitness exercises. In doing so, we will also learn about how to stay safe when using the internet. In English lessons we will be looking at different traditional tales with a twist! 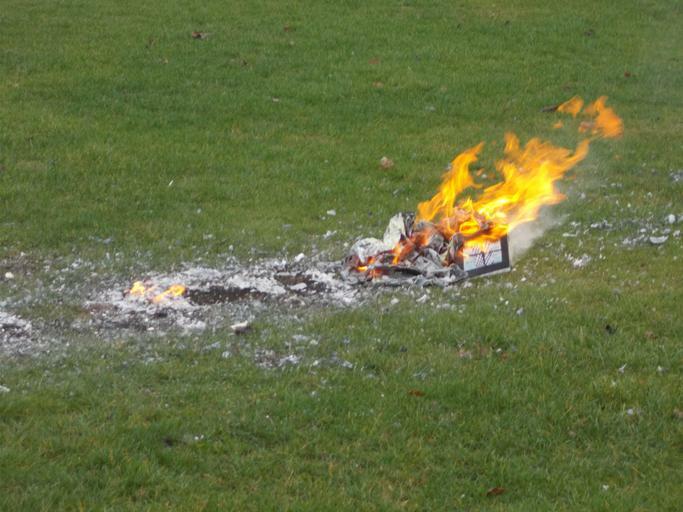 We will be looking at alternative endings to some of our favourite stories, and then write some of our own. We will also write a recount about our fantastic trip to Eureka, and create posters about healthy eating. In Maths we will be exploring measurement. We will look at the different ways to measure length, weight and capacity and use our skills to measure different things in the classroom. 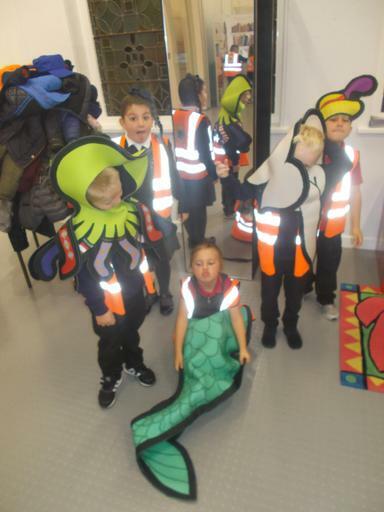 We are so excited to be going to Eureka on Wednesday 6th March! We can't wait to share with you the photographs and fun facts that we have find out! 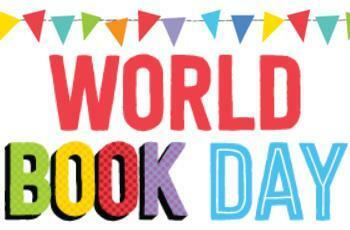 It is also World Book Day on Tuesday 5th March so your child is welcome to come to school dressed as their favourite story book character. 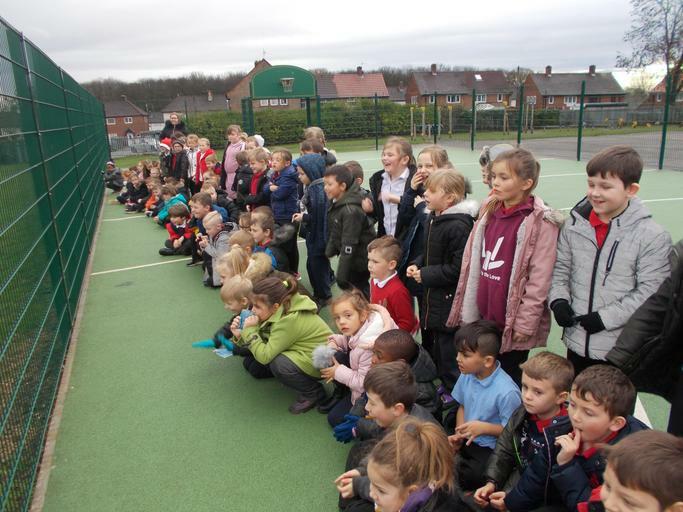 Welcome back KS1! We hope you have had a lovely break and are ready to get learning! 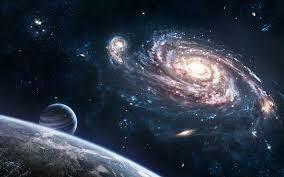 This half term our topic is Space. This half term, the children will have many writing opportunities. 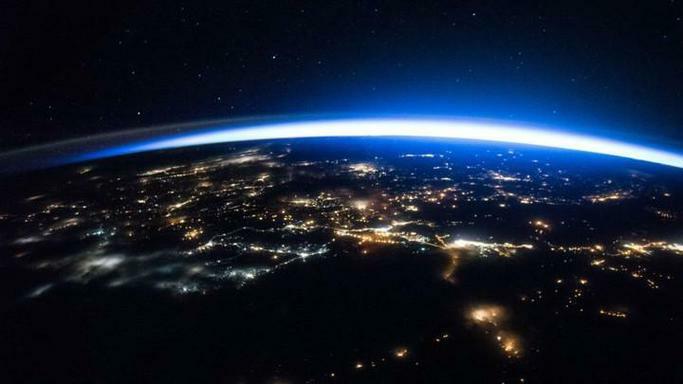 We will be looking at books linked to space and using these to write an alternative ending using adjectives, conjunctions and time connectives. In Maths we will be learning about multiplication and division. We will be using practical methods at first and then we will progress to solving word problems. In science we will be learning to name the planets in order. We will also create our own mnemonic to help us remember the order. 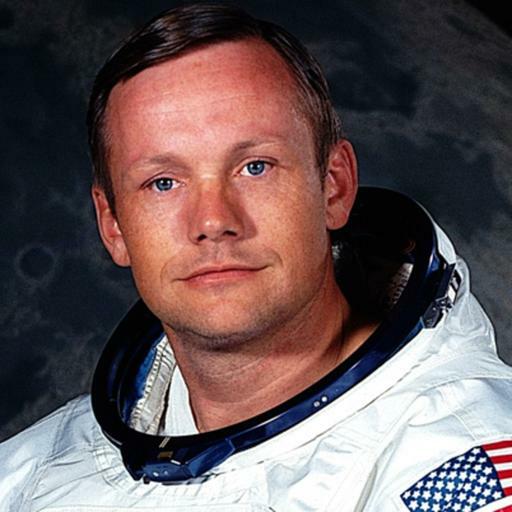 Apart from learning all of the interesting facts about space, the children will be focusing on Neil Armstrong. He is a significant individual linked to the topic. We will be learning all about his experience on the moon. 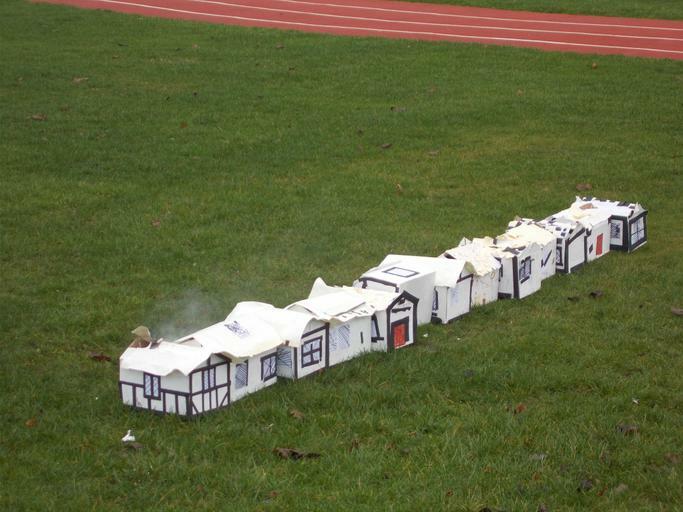 We have spent the past week building our own Tudor houses in topic lessons. 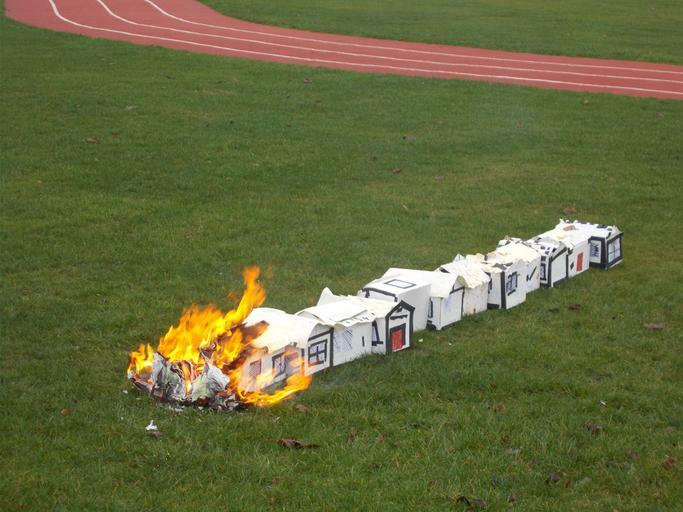 We painted boxes white and decorated them to look like real houses from the Great Fire of London. 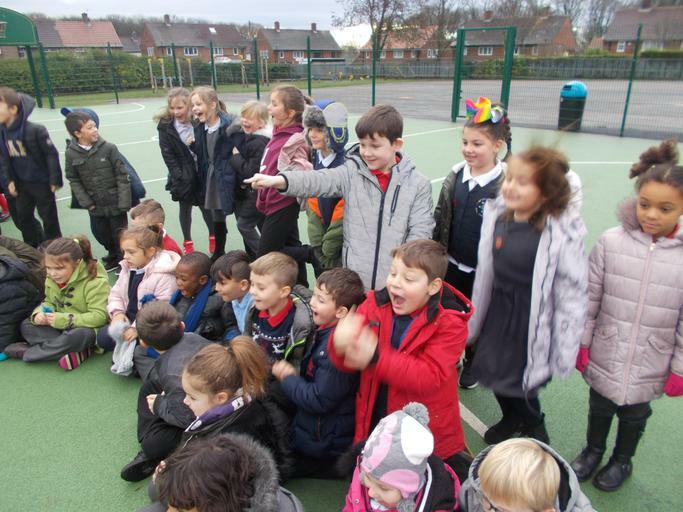 The children in year one have had a brilliant week! 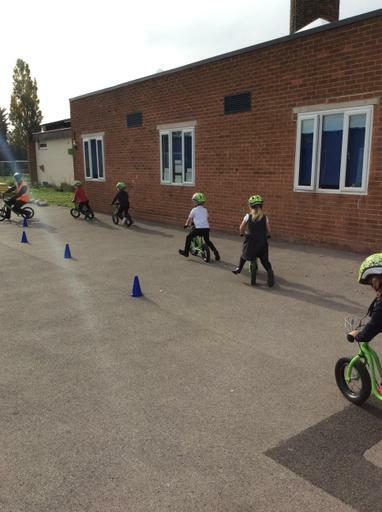 They have all been learning to ride a bicycle. 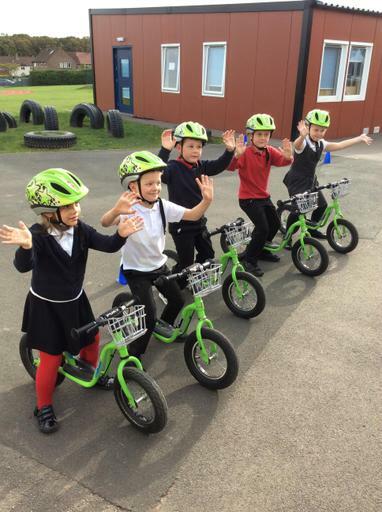 The bikes that they have been using are specially designed to help their balance, it has been amazing to see the children grow with confidence as their balance becomes sturdier. 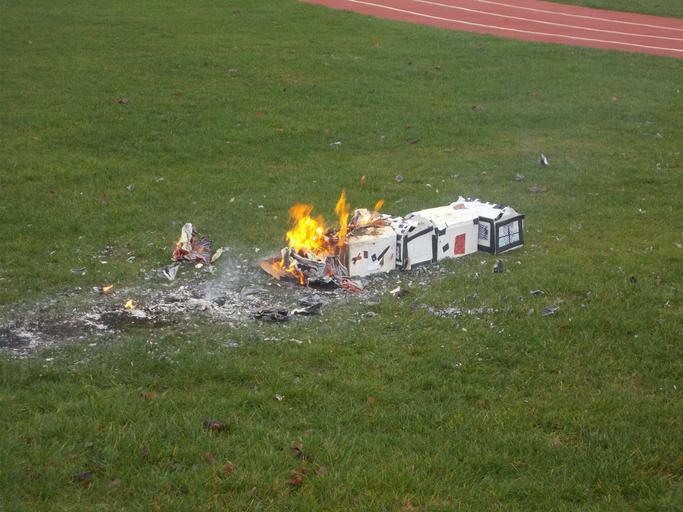 This is all thanks to Phil, the fantastic instructor. You can see more of the photos on the class gallery page. 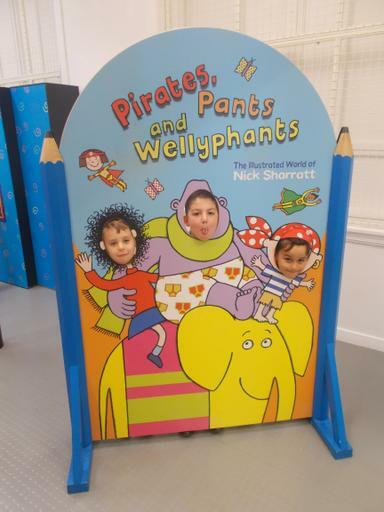 Last week, Year 1/2 were invited to a Nick Sharratt exhibition at Leeds Library. We learnt all about Nick's life and how he came up with the ideas for his amazing books. We loved dressing up as some of his most famous characters! 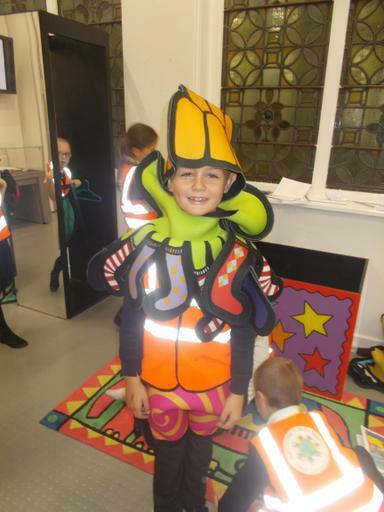 Take a look at some of our fun snaps! We also got a visit from a Dinosaur expert who brought in lots of fascinating fossils for us to look at and hold. She told us lots of interesting facts about different dinosaurs, and then we watched a 3D film all about the Jurassic era. Can you guess our new topic? Over this half term we will be answering this question in all of our learning. We will also learn lots of interesting facts about dinosaurs. 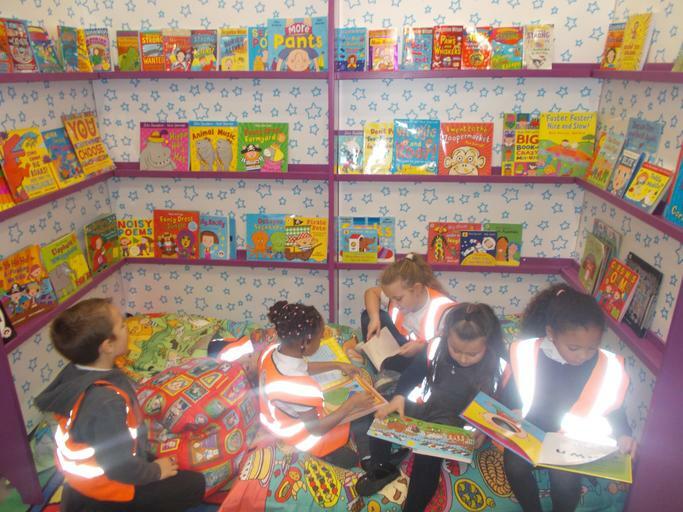 Literacy: Children will be enjoying a range of dinosaur stories this half term. We will be learning all about the Dinosaur Chase and thinking of amazing adjectives to describe the different dinosaurs in the book. We will also be doing lots of work on our sentence types, particularly 2a sentences, 4a sentences and BOYS sentences. Numeracy: Children will spend the first couple of weeks looking at the basics of number including: counting on and back; ordering numbers and place value. We will also look at different practical methods to help us solve addition and subtraction questions. Science: Children will be looking at dinosaur skeletons and grouping animals. We will also learn which dinosaurs loved to eat plants, meat – or both!! Children will compare the skeletons of dinosaurs to that of humans and other common animals. History: Children will find out all about different dinosaurs! We will look at when and how the dinosaurs lived millions of years ago. Children will create their own dinosaur worlds in the small world area. We will compare dinosaurs and talk about how crocodiles and alligators have evolved from them! Art: Children will be looking at dinosaur skeletons and using different mediums of art to create a picture of their favourite dinosaurs. Music: Children will create dinosaur movements to accompany music. 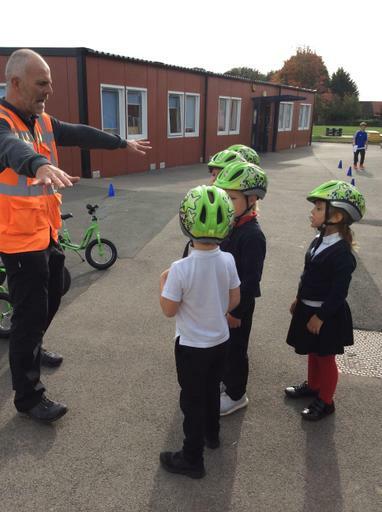 We will think about how we can move our bodies – just like dinosaurs! We will experiment with sounds and compose our own music. RE / PSHCE / Citizenship: Throughout this learning unit, children will think about new beginnings as we start our new year of learning. We will talk about our targets for the year and things we would like to achieve. In RE we will be learning about why stories are important and which books are special to religious groups. We are lucky to have The Dinosaur Dome visit our school, on the 26th September. They are a mobile planetarium which will provide dinosaur shows to stimulate children’s minds. 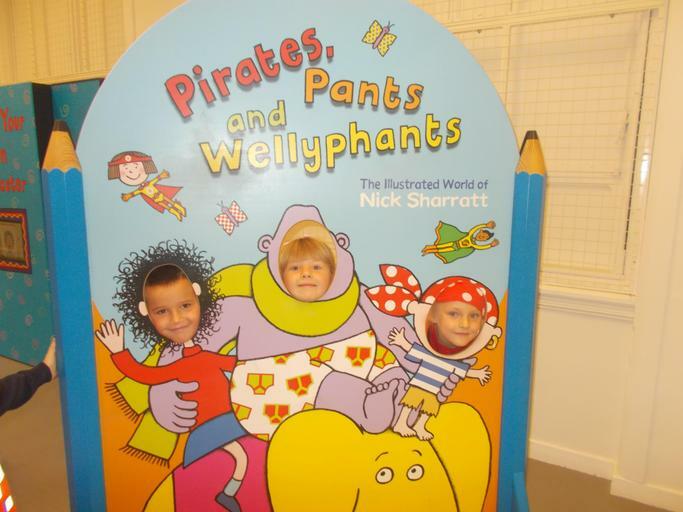 KS1 will also be going on a trip to Leeds Library to take part in workshops with the author Nick Sharratt. Internet Safety Visit Hector's World and find out how to stay safe on-line. Mathletics Log on to Mathletics here! Obb and Bob (Phonics) Help your child prepare for the Year 1 Phonics Screening Test here! Obb loves nonsense words, while Bob will only eat real words!